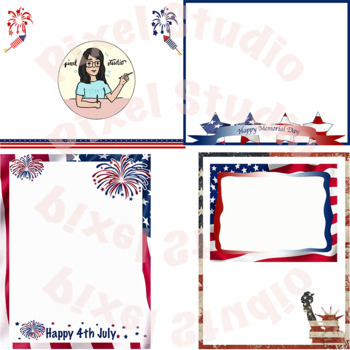 This is a set of 10 vibrant, bold and beautiful patriotic frames that can be used for Memorial Day, Independence Day, Veterans Day letters, projects, notes and worksheets. The background of the frames is white and images are sized 11X8.5 inches or 8.5X11 inches and can be resized to fit your sheet sizes. The images are 72dpi. Hope you like the frames. Please do not forget to leave me a feedback.